This may come as a huge surprise to a lot of people, but Cardi B and Offset are married. The two reportedly got married in September ... a month before Offset's public proposal went viral. 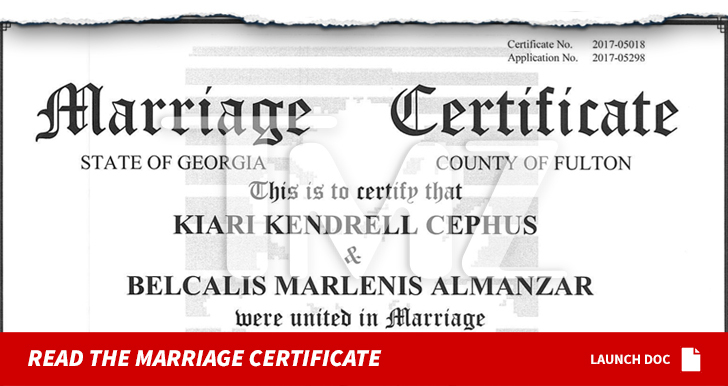 New information obtained by TMZ shows the couple got married in Fulton County, GA on September 20, 2017. Sources close to the couple tell TMZ Offset and Cardi hired an officiant to come to the house and marry them in their bedroom, with B's cousin serving as the only witness. The gossip site also reports that their public engagement back in October at Power 99's Powerhouse concert was not a proposal but more of a promise fulfilment. The whole thing reportedly happened so fast that Offset forgot to buy her a ring. At Sundays BET Awards while receiving the award for best group alongside fellow Migos' members Quavo and Takeoff, offset excitedly said "I thank my wife. You should thank yours." The couple will have an official ceremony after Cardi B gives birth. Well, I guess it's congratulations to the new couple and soon to be parents.